While the start of fall semester at Michigan Tech heralds the beginning of a new adventure for new and returning students, it also brings back many fond memories for our alumni. For some, it’s memories of moving into the dorms or buying textbooks; for others, it’s their first class on campus and meeting their advisors for the first. However, most would agree that it was the student activities outside the classroom that they remember the most. Whether it was their first Tech football game or homecoming activities, if you’ve been a student at Tech since the early 1950s, you remember the fun and excitement of K-Day. K-Day, short for Keweenaw Day, has been a favorite annual tradition of Michigan Tech students since 1951. The first Keweenaw Day was established as a way to bring the campus community together. In response to a growing student body at the then Michigan College of Mining and Technology (MCMT), faculty member, Dr. Charles San Clemente, suggested to the Faculty Association in the spring of 1951 that the college consider a campus community-wide picnic to bring students, faculty, and staff together before the rush of mid semester. The November 1951 edition of the MCMT Alumni News reported on the success of the first Keweenaw Day celebration held on October 9 held at the picturesque Fort Wilkins State Park. Over 1,000 members of the campus community and their guests attended the event, marking “the beginning of a fine tradition.” The sounding of the campus siren (sometimes referred to as the Engineer’s Whistle) at 11 a.m. marked the end of classes for the day and the beginning of Keweenaw Day festivities. Buses and vans shuttled people up the coast to take in the scenic vistas of the Keweenaw Peninsula. Upon arriving at Fort Wilkins, K-Day-goers were treated to a picnic lunch and a variety of activities, including games, sightseeing trips to the lakeshore and up Brockway Mountain, small game hunting, and fishing. A highlight of the day was the faculty-student baseball game, pictured here. While the game was all in fun, there are rumors that the students won. After the games and tours were ending, K-day culminated in a sing-along around the campfire. In its 67 years a Tech tradition, K-Day has seen some changes, but at its core, the main themes of festivities, food, and friendship have remained the same. The event was moved to McLain’s State Park in 1976 to shorten the driving time from campus and reduce the road congestion that plagued the event in its early years. Picnicking and fun activities have always been central to K-Day, but additions over the years has kept K-Day a favorite among students. Inflatable games, live music, contests and informational booths; as well as demonstrations featuring medieval fighting, Bonzai bikes, and exploding gummy bears. The student organization fair has also been a great way for new students to learn about campus activities and organizations. Generous financial and moral support from the College administration and the Student Organization helped to support the event in the early years before the Memorial Union Board took over responsibility in 1967 and Inter-Fraternity Council in 1976. Today, K-Day is sponsored by Fraternity & Sorority Life and Student Activities and still a much-beloved campus event. As Michigan Tech welcomes a new class of Huskies to campus and another day of K-Day, take a trip down memory lane and share your own K-Day stories! Back to school time again…so I’d thought I would share this example of when you are a Freshman and walk into MEEM 4220 instead of ENG 1101 somehow. Assistance needed. I’m a 2016 Army ROTC grad stationed in Hawaii. I ran into a 2006 Airforce grad, and only got his first name, “Scott.” He paid for my breakfast and left. Would anyone know who this is? 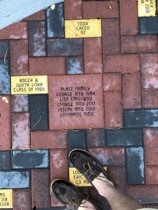 So excited to finally see our paver by the clock tower!!! My son just sent us this photo. On our way up this weekend to see in person! So proud to be a Tech mom and wife. There was something magical about Houghton and Dad’s years there that were absolutely transforming. Incidentally, Dad is being buried in his Michigan Tech sweatshirt! -From the daughter of Evans Foertmeyer, Class of 1945 on the death of her father.